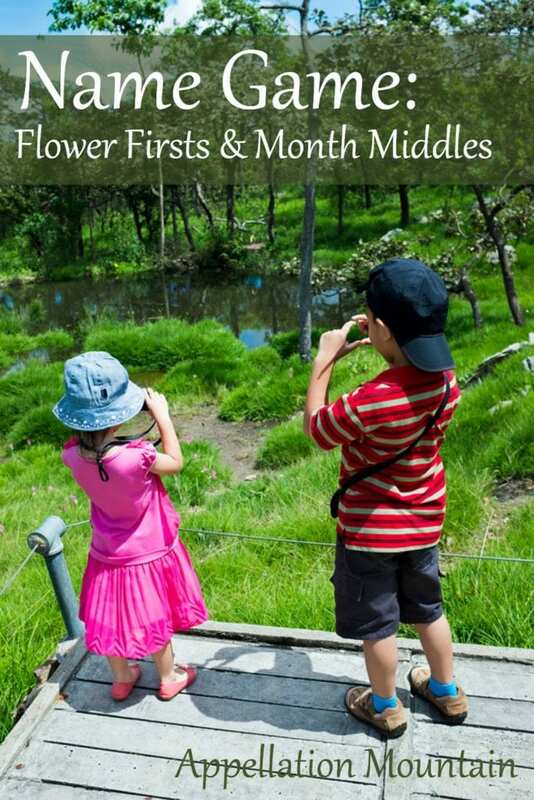 Here’s a fun name game challenge for your Wednesday: take a flower first name – or any nature name – and combine it with a month middle. Of course, if this name game works with any nature name, maybe we shouldn’t limit ourselves to just month names. Days of the week, maybe? Seasons? I’ll start with my twelve favorite combinations, but there’s no limit to the possibilities. 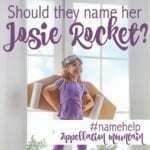 The challenge for this name game is to come up with combinations that sound like given names, rather than something you might pick up at the garden shop. Thanks to Danielle for the suggestion! See, I’m cheating already! Rowan belongs with the tree names, not the flower names. 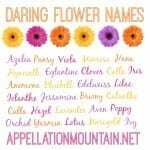 But combining flower firsts and month middles comes easily for girl names. To challenge myself, I wanted to include combinations that would work equally well for boys. Rowan makes a mainstream pick for a son, and J is a go-to middle initial for boys. In this case, the J stands for a month, rather than the more conventional James or John. For something even more daring, I considered Dahlia Janvier – the vintage, elegant floral name with the French form of the month. A confession: I go out of my way to avoid say February. I grew up pronouncing it without the ‘br’ sound – just plain Febuary. Even though I know the mistake belongs to me, I still find it tough to say correctly. And so this felt like the toughest of the twelve. That’s why I paired February with Calla. Calla makes a great alternative to Ella and Stella, and fits right in with Cora and Clara. As flower names go, Calla feels subtle without Lily to complete it. And yet, I think it satisfies the challenge nicely. I count March among the most underused single-syllable middles of all time. If June works, March should, too! Sure, it can sound like a verb – but verbs can make great baby names. But March is also feminine and literary (think Louisa May Alcott’s Little Women family) without sacrificing any of the strength March derives from its namesake, the Greek god Mars. 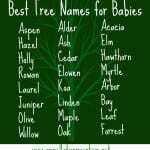 Hawthorn also belongs with the tree or shrub names, but I think it works in this list. For girls, I would consider combinations like Delphinia March or Linnea March, pairing something lighter with the strong middle name. Yes, the month is called April. But Avril – the French form – strikes me as far more stylish, thanks to the letter v. And Avril Lavigne. And Jane Avril, the dancer immortalized in Toulouse-Lautrec’s paintings. Up-and-coming flower name Magnolia feels elaborate, showy, and big enough to stand up to such a cool, edgy middle name. I suspect we’d find plenty of girls with names like Lily Mae. Maybe even a few Daisy Maes, though the long-running Lil’ Abner comic strip made that synonymous with a certain Southern stereotype. That’s why I think Mae works best with a less obvious floral first, like the pan-botanical Zahara. Zahara comes from Arabic. It can mean shining and bright, or it can refer to flowers. I had some doubts about whether Zahara really derived from the Arabic, but it turns out there’s a type of zinnia called the Zahara – so either way, it’s botanical bona fides are all set. Like Mae, June almost feels more like a name than a month, doesn’t it? There are so many great names starting with the sound, and June boasts a long history of use as a given name. So how about Anthea June? Anthea makes for another subtle, vaguely botanical choice. And I’m a sucker for the nickname A.J. I wanted to ensure that half of my name game entries were suited for boys. July comes from Julius, as in Caesar, which seems like a natural fit for a boy. But then Hazel July floated into my brain, and I couldn’t shake it. I’ve tracked the changed opinions about Hazel closely. We dismissed it as too granny when Julia Roberts announced it as her daughter’s name back in 2004. Then we swooned over it when John Krasinski and Emily Blunt welcomed their daughter ten years later. The Fault in Our Stars gave the name a romantic vibe, and introduced the smoosh Hazelgrace to our list of possibilities. I do think July works well for a boy’s middle name, too. River July, maybe? Or Harbor July? Because I couldn’t quite settle on a favorite boys’ combination, I’m sticking with Hazel July for this one. 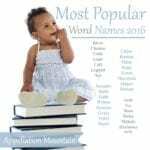 August fascinates me, because it has so much history as a given name – long before virtue names or nature names were popular. And yet I found it tough to pair with another nature name in the first place. Linden August strikes me as a great name for a boy – though I do think Linden or August might work for a girl equally well. But this combination feels just masculine enough – a tree name and a month name, though not too aggressively a nature name, either. I know, I know. Olive is the nature name, and it’s a tree, not a flower. But Olivia September flew into my head, and I can’t let it go. For a name that fulfills the name game requirements in a stricter fashion, maybe Camellia September or Ivy September? I think there’s something appealing about names with the letter ‘v’ combined with September. I wanted October to be a boy’s name. Some have suggested Toby as a nickname for October, and I really think it works. But I kept coming back to Meadow. There’s also Beryl October, a combination I love. But Beryl is a gemstone name, which feels too far removed for this challenge. And the initials B.O. always give me pause. Kale is green and leafy, a vegetable name. Does that make it close enough to count as a flower name? Maybe not, but stay with me. Edible names for girls have gone mainstream, so why not Kale for boys? I love the vowel sound of Kale combined with the sharp ‘v’ of November. In general, I like short names with strong vowel sounds paired with November – Jude, Lane, Vale, and so on. But Kale is the only nature name I could find that paired well with November. Well, wait … there is another one! Rose November might be truly gorgeous together. But Rose feels like it goes with nearly any of the month names, from January to December. And so I’ve held off using it on this list. Likewise, Lily feels like an easy fit with most of the middle names on this list. Lily September, Lily August, Lily June. But I really do like Lily best with December. It’s unexpected – a spring name with a winter one, but there are Christmas lilies, too. That said, I do think that December works better for a boy’s name, probably with the nickname Dex. But what works well as a nature-inspired first name? I’m stumped! Now it’s your turn! How would you combine a floral or nature first with a month middle? I can’t wait to hear your name game ideas! Lily July is my unexpected favorite from the bunch. Breaks all the rules but I still like it. I don’t pronounce the first ‘r’ in February either! Is that wrong? I had never noticed! Fun challenge! For some I used some root namesakes or borrowed month words from other languages. There’s a great Auntie Bluma in my family tree. Flower in Yiddish but big pants(knickers) when she got to the UK! Did they mean like “bloomers” or is the word “bluma” actually a term for underwear in the UK? Sigh. The UK managed to wreck my other favourite flower name- Flora. It’s the name of a popular margarine spread there and “spread” jokes apparently are associated with the name Flora! Ridiculous! My favourites from the list I came up with were Accacia May, Ivy September, Cypress Winter and Willow Wednesday. How fun! Love Zahara Mae and Linden August. Some of these are a bit out there, but I really like Gladiola June, Rose Dimars, Madder Aibreán, and Gentian August. Um… this might be the most brilliant list yet!!! Magnolia Avril – so spunky. Love it!! Hawthorn March – quite possibly the most amazing name ever! !